Largehearted Boy: Book Notes - Kelly Barnhill "Dreadful Young Ladies, and Other Stories"
Book Notes - Kelly Barnhill "Dreadful Young Ladies, and Other Stories"
Previous contributors include Jesmyn Ward, Bret Easton Ellis, Celeste Ng, Lauren Groff, T.C. Boyle, Dana Spiotta, Amy Bloom, Aimee Bender, Heidi Julavits, Hari Kunzru, and many others. 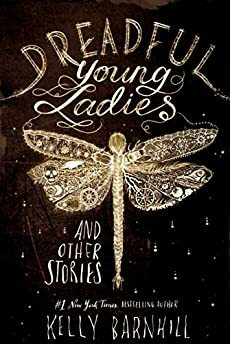 Kelly Barnhill's Dreadful Young Ladies, and Other Stories is an enchanting and lyrical collection. "Each story is written in intensely poetic language that can exult or disturb, sometimes within the same sentence, and evokes a dreamlike, enchanted mood that lingers in the reader's mind. These tales are made to be reread and savored." I see them, too—writers at coffee shops or at the library, typing away to the internalized rhythms of whatever music is sliding out of their earbuds. I know writers who have play lists for their books, or specific songs that ground them in the space in their heads from which all writing grows. I know writers whose work drifts down rivers of melody and rhythm, and I have to say I'm envious. I love music—always have. And I'm not bad at it. I have sung in choirs and quartets and used to sing in both churches and in bars to make under-the-table cash when I was a poor exchange student and was barred from working legally (don't tell the authorities). (Also? In case you were wondering: the bars paid better.) I play the piano and the guitar and once tried to learn the oboe, but it didn't go very well. I listen to music when I'm reading or cleaning or cooking dinner, but I absolutely, without question, cannot—cannot—listen to music while I'm writing. And I never actually wondered why until now. I was asked, dear readers, to tell you my playlist for my new book, Dreadful Young Ladies, and Other Stories. Alas. There is none. As a writer who lacks the neural networking for any kind of "visual thinking"—my brain operates almost entirely in language, sound, and other non-visual sensory information—I rely on my own internal voice as I write. I cannot see a story in my head; I can only hear it. So that means, every time, it has to sound right. It has to feel right in the ear and the mouth and the chest. It has to resonate. It has to vibrate in my bones. And because of the particularities of my attunement to the aural sensibilities of each sentence, any music at all when I write becomes a distraction. Which isn't to say that I operate in utter silence. Of course not. There is no such thing as utter silence. The world is noisy. Even when it is quiet. And the noisiness of the quiet world becomes, for me, its own kind of music. Its own playlist. And this is what I write to. "The Wet Mouthed Breathing and Dreamy Sighs of the Baby That Has Finally Napped." Two of these stories were published originally in 2007, but were written two and a half years earlier, when my son was an infant. There is a sound that a sleep-averse baby makes when they have finally drifted into slumber deep enough to keep them still and content. It is a sound that feels like a soap bubble in the hand—so fragile as to make it ungraspable. A thing simply to be wondered at. It is a sound that means that the half-written story in the notebook can, miracle of miracles, get another sentence. And maybe it can live. It was, for a time in my life, my favorite sound in all the universe. "The Quiet Gurgles and Creaks of an Only Somewhat Haunted House." I have been lucky, in my life, in the ghost department: my ghost, I think her name is Evelyn, did laundry. This is true. She lived in the basement and smelled like talcum powder and Aquanet and every once in a while gave a derisive snort. And she folded laundry. Maybe because she was bored? It's hard to say. All I know is that I would put clothes in the dryer and would come down later and find them folded in a stack and I was the only one home. I appreciated it, and told her so (she never responded), and I missed her when she finally took her leave of us. But there is nothing that pulls a story along like listening to the rheumy sigh and sidelong murmurs of the joists and lintels of one's elderly home, and knowing that maybe, just maybe, not all of those sounds are due to aging architecture, but rather occur because Evelyn, as per her nature, is feeling busy. "The Silent Sound Snow Makes When it Gives Way to Water." I live in Minnesota, which means we live with the seasons. Each transition from this season to that season is written on our skin. Snow, while seemingly inert, is a treasure trove of sound. It squeaks when it is bitter cold. It muffles footsteps and quiets voices when it falls. It holds its breath. It shimmers in the ear. And then, when the weather warms and the crystalline structure begins to collapse, it yawns and sighs like a broken heart, before folding into a silent sob. This was the sound I heard, incidentally, this afternoon, as the temperatures climbed and the snow began to shake. It is, I have to say, the saddest sound I know. "The Anticipatory Sound of a Household That Hasn't Yet Woken Up." This is my current favorite sound. When each bed is warm and mounded over and full of sleep. When the wood floor is cold and the tea is warm. When, even from where I sit downstairs, all I hear is breathing. And not just my family members. The floor breathes; the walls breathe; the windows breathe. Everything is present and calm and without needs. Everything in the house simply is. "The Scritch Scritch Scritch of the Pen on the Page." There is nothing better than the sound of a story being written by hand. There is a musicality to handwriting—a phrasing and a rhythm and even a harmonic structure. The ink in the cartridge slurps. The knuckles creek. The paper squeaks. The pen attempts at fluid motion and fails. It scratches. With each word. It pulls bits of the paper off with it. It does not apologize. The world we live in is loud. Our machines are loud. Our news is loud. Our government is loud. Writing, for me, is quiet. It is good that it is quiet.